I dare you to dip into my homemade salsa recipes and not dive in with both feet and a chip in each hand. 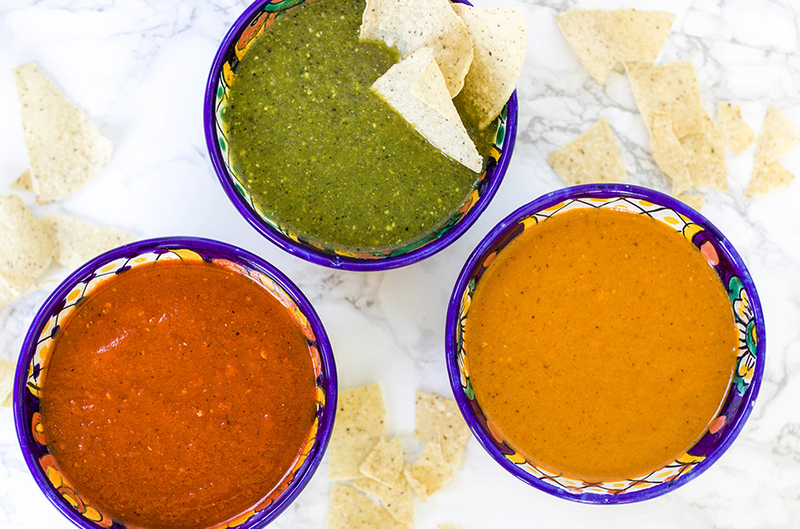 Whether you fancy the grilled tomatillo and cilantro blend, a smoky tomato and chipotle salsa, or the extra spicy toasted árbol pepper salsa, you’ll find the perfect balance of flavor and kick. All fresh, healthy and delicious, this salsa trio is also so easy to prep, you’ll find the the hardest step is deciding which one to serve. 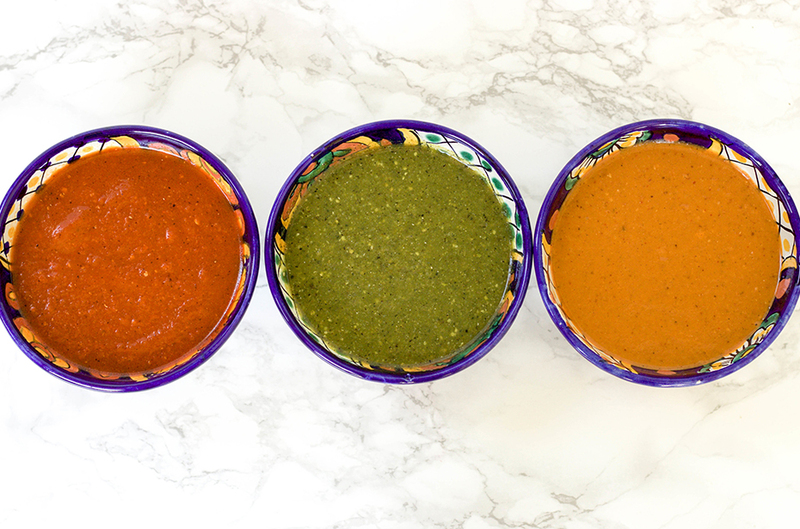 Make all three and swear off bottled salsas forever! 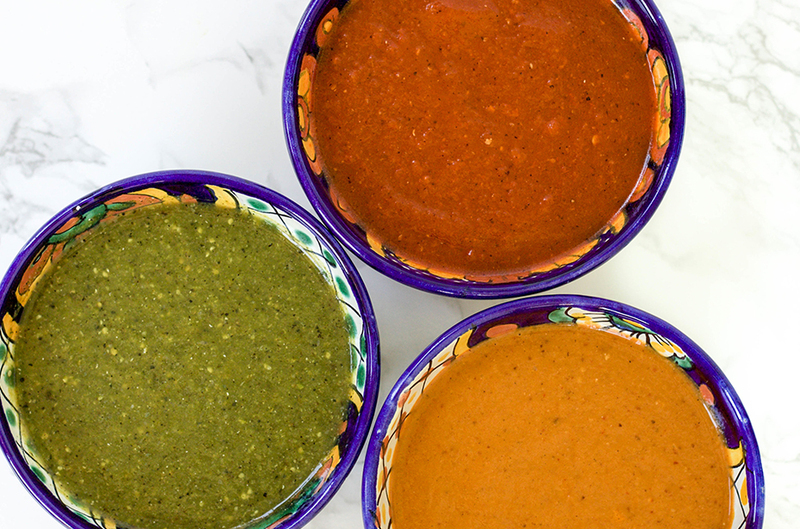 I first served them as part of a fish taco bar setup, but you’ll want to pair these salsas with everything from eggs and grilled meats and veggies to a basket of chips. Make extra – they’ll keep in the fridge for up to 5 days. Grill the tomatillos and chiles serranos on a grill or grill pan until they develop a nice char. Place in the blender and add the remaining ingredients. Blend until smooth, 30-60 seconds. Grill the tomatoes on a grill or grill pan until they develop a nice char. Place in the blender with the garlic clove, chipotle, water and salt, and blend for about 30 seconds.Heat the olive oil in a small saucepan. Add the tomato mix and cook on medium-high for 5 minutes. Serve warm or at room temperature. Break the chiles in half and tap on plate or cutting board to knock out the seeds. Remove stem. Discard stem and seeds. Heat oil in a small skillet over medium heat. Add tomatillos, and cook on medium to medium-high about 5-7 minutes until browned. Remove from pan. Add chiles and cook about 3-4 minutes. Remove from pan. Combine chiles, tomatillos, garlic, salt and water in a blender and blend on high. Everything from fish, chicken, meat or veggie tacos to eggs, and of course, chips. A nice Riesling will balance out the heat! Make plenty. These all keep in the fridge for up to a week.